Ava Frid's Valentina Midi dress is certainly a must-have dress for every modern woman. Viewed from the front, Valentina evening dress may appear just simple and elegant, revealing an asymmetric decollete and two taffeta bows discreetly decorating the sleeves' ending. 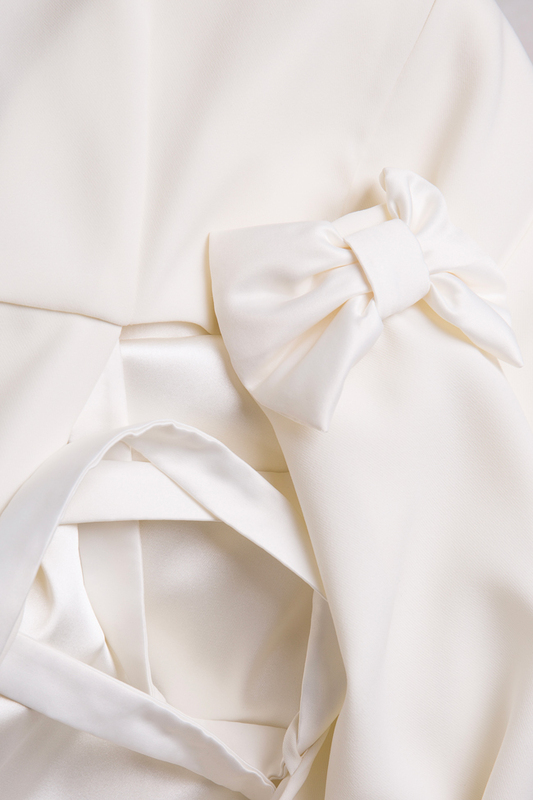 But this dress will definitely transform when viewed from the back, becoming surprisingly sensual - it turns out to reveal an open back finished by delicate taffeta ribbons which cross-over each other to fasten the dress. Valentina is a dress made of fluid and silky crepe, that discreetly follows the curves of the body, with a conic cut on the legs for extra touch of femininity and elegance. Match yours with high heeled stilettos or high heeled sandals and discrete jewelry for an unforgettable appearance.